Authorities are investigating how a fire destroyed a home Tuesday afternoon in Saugus, Massachusetts. 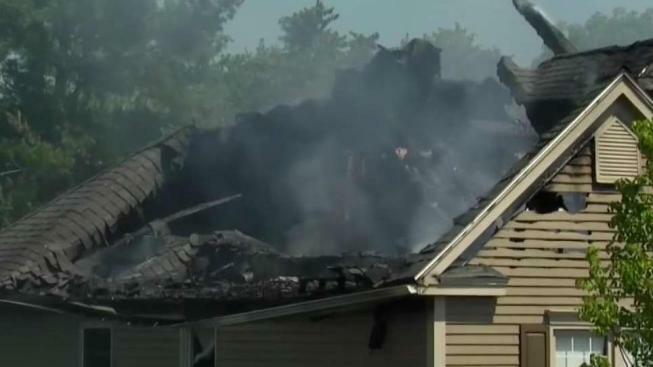 Authorities say the spontaneous combustion of rags being used to stain the back deck is the cause of a fire that destroyed a home Tuesday afternoon in Saugus, Massachusetts. The state fire marshal and Saugus Fire Chief Michael Newbury announced jointly on Wednesday that workers had been in the home at 81 Juniper Dr. over the past few days painting and floor refinishing. The fire started at about 12:30 p.m. Tuesday where a supply of used rags had been sitting. "It is important to dispose of oily rags by hanging or spreading them out flat outdoors. Professionals should dispose of them in a listed oily waste container and do-it-yourselfers should put them in an airtight container with a lid like a paint can and cover them with a solution of detergent and water then dispose of at a hazardous waste collection event," Newbury said. When crews arrived at the home, flames were shooting from the roof. The blaze quickly reached 3-alarms and destroyed the home within minutes. Relatives said the owners, two pastors, were away in Brazil on a church mission with their young son when the fire broke out. "The most important thing my mom just said is that no one was inside and everyone is OK," said Ouriel DeJesus, whose sister and brother-in-law own the home. While nearly everything was destroyed, firefighters were able to pull the couple's wedding album from the home before it burned. "Losing a house is a traumatic event," said Newbury.